Marilyn SanClemente May 11, 2016 May 11, 2016 All Occasion Card, All Occasion cards, Anniversary Card, Birthday, Occasions catalog, Stamper's Club, Stampin' Up! 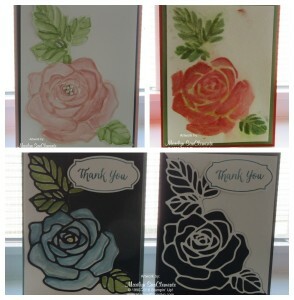 Today I am sharing a set of cards that I made with the Rose Wonder stamp set and matching framelits by Stampin’ Up!. These are the cards that I made with my Stamper’s Club in April. This is a beautiful stamp set and I am so glad to see that it made it into the new 2017 catalog that is coming out in June! In the meantime you can still purchase this set as a bundle (140804) but the bundle option will be going away with the new Catalog. So if you have been thinking about this set – now is the time to get it! As you can see this set is really versatile and can be used several different ways. The top right card is made with Blushing Bride, Basic Gray and White Shimmer paper. The Rose is cut out using the framelits. The rose is painted using Blushing Bride and Pear Pizazz inks with an aqua painter. I love the watercolor effect! The second card is made using Calypso Coral and Pear Pizazz on Watercolor paper. The Rose with Leaves was cut out and used as a stencil for this card. So the cut image was not glued to the card but used as a stencil to paint the flowers. One of the keys to using Watercolor paper is to spritz the paper with a little water and to let the ink run a little. The third and fourth cards are made with a layer of Whisper White and Night of Navy. The key to these cards is to use the cut out image and the negative image to outline the card. The blue Rose is colored with Lost Lagoon ink and an aqua painter. Like these cards? Are you interested in receiving cards ideas like these each month in your in box? Think about joining my Stamper’s Club. You receive the instructions each month for a set of cards made with a specific stamp set and Designer paper for FREE with purchase of $35 each month. You can see more information about my Stamper’s Club HERE. So an update on me – I know that I have been missing in action for the past few weeks. I have been busy getting my house ready to sell and moving into my new place as well as going to Stampin’ Up! On Stage in Salt Lake City in the middle! Salt Lake City was fantastic as always. I am always amazed by all the talented people that I meet each time I am at a Stampin’ Up! event and the friends that I get to catch up with that I have made thru the years! So I am in my new house and in the process of setting up my new Creative Playground! I am about half way there and still have lots of boxes to unpack! But I am holding my first class on Friday. The best part of my new house is the 1,000 square foot finished basement for Marilyn’s Creative Playground! When I moved out of my Tewksbury house, I had things spread out between 3 rooms! The best news is that all of my hard work on my house paid off. I spent a lot of time painting, replacing carpet and freshening up some of the rooms in my house and it sold very quickly. In the meantime – the cats and I have been camping out in my new place with very little furniture as it was left in the other house to keep it staged. I can’t wait to move my bed over! I will post some pics of my new space over the next few days as I unpack more things! Take care and Happy Stamping! don’t forget about ordering that Rose Wonder bundle before the bundle goes away and also stock up on your favorite retiring in-colors before they are gone!